Consultations for the establishment of a Public Council at Bulgaria's presidency were brought to an abrupt end after representatives of the protesters walked out. 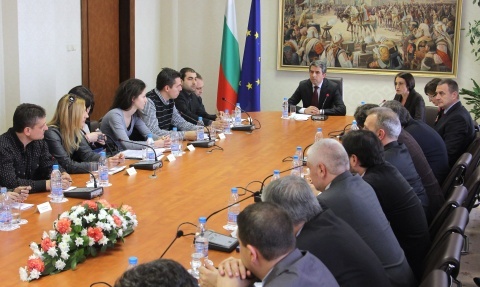 Nine of the ten invited representatives of the people and groups protesting in the streets, walked out of the meeting with President Rosen Plevneliev, aimed to form a Public Council as part of Bulgaria's caretaker government. "I will not sit at one and the same table with those whom we fight. We are leaving because we want to fight, fight until the end," Angel Slavchev told reporters. Slavchev repeated several times that he would not give in and urged people to take part in a nationwide protest on Sunday. Thirty five representatives of people who demonstrated for weeks against poverty and the political system, of the trade unions, the business, of civic organizations, the academic community, and of NGOs were supposed to debate the tasks and the rules in the work and the structure of the future Public Council. The Council will be chaired by the Deputy Prime Minister in the pending caretaker government. The Public Council is planned to be a consultative body at the caretaker government in making decisions, issuing opinions, and adopting initiatives. On February 21, Bulgaria's Parliament approved the resignation of the government of Prime Minister, Boyko Borisov, and his ruling Citizens for European Development of Bulgaria party, GERB, amidst unprecedented since 1997 protest rallies against unbearable utility bills, monopolies, and wide-spread poverty that turned into a civil unrest against the political model of ruling the country.